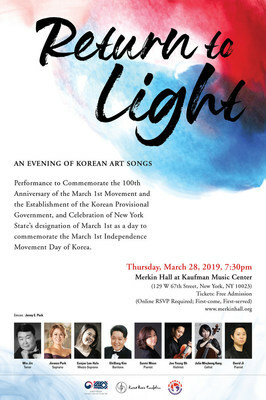 NEW YORK, March 14, 2019 /PRNewswire/ — Korean Cultural Center New York (KCCNY), a branch of the Ministry of Culture, Sports and Tourism of Korea, is proud to present Return to Light: An Evening of Korean Art Songs. The concert will be held at Merkin Hall at Kaufman Music Center (129 W 67th St., New York NY 10023) on Thursday, March 28, 2019 at 7:30 pm in association with the Korea Music Foundation and the Korean-American Association of Greater New York. The evening’s program includes pieces that have rarely been presented in New York. The program features the works of “genius” composers of modern Korean music such as Soonnam Kim and Geon-woo Lee that had often been neglected due to the fact that they had crossed over to North Korea in 1948 and 1950, respectively. Geon-woo Lee’s “Golden Grass” (Geumjandi) is considered to be a representative work of Korean national music, and Soonnam Kim’s “Flowers on the Mountain” (Sanyuwha) was even praised by the Russian composer Dmitri Shostakovich and the Armenian composer Aram Khachaturian. 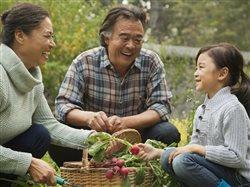 Gagok has its roots in Western music, with the rise of the art song genres such as German leid; however gagok contain the unique Korean emotions of ‘han,’ a deep sense of sorrow and resentment, and ‘uhl,’ the spirit of Korea. Gagok that were written during the period of Japanese colonialism were especially viewed as a symbolic source of comfort and solace. The program is divided into two parts: Part I include songs that were composed in the 1920s, at the height of colonization until Korea’s liberation in 1945, while Part II focuses on gagok and its more contemporary renderings composed from the 1950s to 1990s.